Like any other indication, the use of lasers in pigmented lesions begins at the helm of laser physics and depends on the absorption spectra of the target chromophore, which is the melanocyte (melanosome). In congenital nevi, there are other issues like variegation of pigment and depth. In moles (CAMN), freckles, and lentigines, the target chromophore lies either in the epidermis (freckles, lentigines) or in the dermis (CAMN), which influences the success of the pigment lasers employed for therapy. For melanin, there is a wide array of lasers that can be used ranging from the green lasers (PDL, QSw, Nd: YAG 532) to the far infrared lasers (CO 2 10, 600 nm, Er: YAG2940 nm). The second important proviso is to minimize the heat damage that requires optimal setting of the pulse duration of the laser. Thus, a laser with a pulse duration less or equal to the TRT should be employed. This depends on the size of the target tissue that dictates thermal relaxation time (TRT), which is 0.25-1.00 μs for the melanosome and 0.1 ms (100 μs) for the melanocyte. Herein lies the logic of using nanosecond lasers (Q switched) to treat pigmented lesions like lentigines, freckles, and Nevus of Ota and the futility of this in treating "moles" with nanosecond lasers. Lack of reproducible results in CAMN can be attributed to the fact that the target nevus cell occur in clusters and are of larger size than melanocytes and, thus, need a millisecond laser for effective ablation. This is the main reason why normal mode, non pulsed lasers, and far infrared lasers are used to treat CAMN. ,, The third requirement is to achieve an adequate depth to target the chromophore for which the red (Ruby 694 nm, Alexandrite 755 nm) and near-infrared (QswNd: YAG 1064 nm) lasers (approximately 600-1100 nm) are ideal. These lasers combine selective absorption by melanin with an appropriate skin penetration. Based on these three principles, the devices useful for treating melanocytic lesions are of two basic classes: , far-infrared skin resurfacing lasers and pulsed lasers/IPLs. The pulsed lasers are further divided into long-pulse (millisecond) devices, which tend to target relatively large pigmented structures such as hair follicles and "nests" of nevus cells, and short-pulse (Q-switched nanosecond lasers) devices, which are capable of targeting individual pigmented cells. Histologically, though CAMN have both isolated nevo-melanocyte cells and "nests" or clusters of cells. , Thus, ideally, a mixture of lasers targeting both should be used, with the use of short (ns) pulses and long (ms) pulses. , This is the reason why melanocytic nevus are better treated with a combination of lasers. Recent studies  used pulsed CO 2 ostensibly to ensure fine ablation of the epidermis, followed by a Qs fd Nd: YAG, Qs Nd: YAG, or Qs ALex laser. The logic employed in the use of combination lasers , (normal mode and Q-switched ruby laser, CO 2 and Qs AL, CO 2 and Qsfd Nd: YAG laser, CO 2 and Q-switched ruby laser) was to expose the otherwise unaffected, deep-sited naevomelanocytes to the pigment-speciﬁc laser. Nevus cells in the superﬁcial dermis are additionally removed by the CO 2 laser. Alternatively, for a smaller "mole" (<1.5 cm), a short-pulsed Er: YAG would be an ideal tool as apart from the pulse duration (300-1000 μs), the Er:YAG has a predictable depth (5 μm/J/cm 2 ), minimal thermal damage (20-30 μm), and a high absorption coefficient of water (Er:YAG 12,800 cm−1 ; CO 2 800 cm−1 ) and is thus capable of a far finer and safer superficial ablation with minimal sequel. 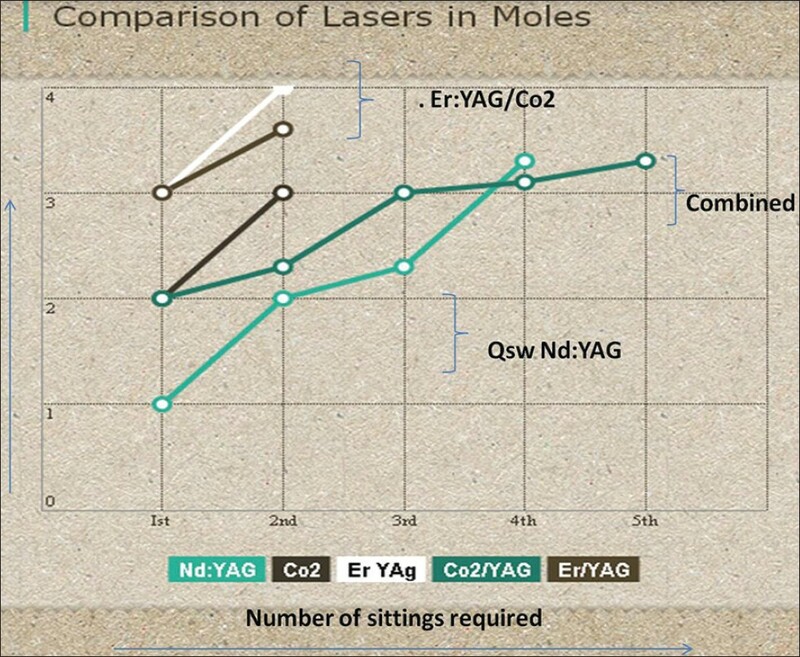 A comparison of various modalities at our centre shows that the combined or pulsed ablative method is better than using the Qsw lasers for CAMN [Figure 1]. The issue of melanoma arising as a consequence to laser therapy is debatable. Though some believe that selective destruction of abnormal melanocytes is a means for reducing the number of cells at risk for malignant transformation, it is also possible that laser or other treatments may inadvertently stimulate transformation to melanoma. There have been reports of histological atypia (pseudomelanoma) in patients with melanocytic nevi that were treated by CO 2 lasers as well as lasers for hair removal. Probably, racial differences need to be taken into consideration as, in Asians, the incidence of melanoma has been reported to be between 0.2 and 2.2 per 100,000, which is much lower than that among westerners. Furthermore, the most common sites for the development of melanoma among people with colored skin are areas not directly exposed to the sun, such as palmar, plantar, subungual, and mucosal surfaces. This accounts for the liberal use of lasers for the treatment of melanocytic nevi in Asian countries. However, it must be pointed out that malignant transformation takes time and, if the patient consults an oncosurgeon or oncologist, it may not always reflect in the long-term complications in dermatological practice. This is exemplified by the development of carcinoma bladder in patients of pemphigus on cyclophosphamide, wherein it takes 15 years to develop the complication  and rarely presents to the treating dermatologist. It has been shown that, of the three common benign lesions that patients often ask their dermatologist to remove, seborrheic keratoses (SKs), melanocytic nevi (MN), and fibroepithelial polyps (FEPs) or skin tags, on histological scrutiny, a malignancy can be detected even when they look clinically benign to the primary care physician, surgeon, or dermatologist. For lesions submitted as MN, the malignancy rate varied from 1.7% to 6%. The relevant question is how confident is the clinician that the lesion is completely benign (which should be 100% if the lesion is not submitted)? Under the ethical principle of beneficence, i.e., acting in the best interest of the patient, and consistent with the physician's characterization as a fiduciary for the patient, it is essential that specimens should be submitted to a dermatopathology laboratory for review. , In some cases, a dermatologist may have competing ethical considerations when asked by an anxious patient to perform a biopsy on a benign-appearing lesion. Beneficence may cause a physician to perform the biopsy to alleviate patient anxiety; however, this dilemma can compete with the ethical concept of stewardship. Stewardship addresses physicians' responsibility for not only their patients but also for the care of society as a whole. It is my opinion that, with the high degree of recurrence with most pulsed and Q switched lasers, a physician is under no ethical obligation to provide what is essentially a futile care. If the issue is of preventing malignancy, serial digital and dermatoscopic photography could suffice. But if it is of cosmetic improvement, the patient must be told upfront that there is a possibility of recurrence. In a litigious society, it would be ideal to do a biopsy as it can predict the possibility of recurrence and obviate the physician's concern of being sued if a malignant lesion develops in future. The alternatives are, in essence, surgical excision, laser treatment, and no treatment. Excision offers the most deﬁnite result and reduction of melanoma risk, although melanoma can arise from a deep remnant of a nevi, if giant, even after excision. Probably, there is a lot to be learnt and done for treating "moles," and the use of a normal mode pigment laser or an ablative pulsed laser would be a good starting point. In this era where the physician-patient relationship remains contractual with fiduciary implications, a histopathology is essential at some point both for medicolegal and scientific reasons. It is absolutely necessary to discuss these issues openly with the patients in the context of alternatives, overall beneﬁts, and risks. Of course, there are merits in shave removal of CAMN, but this technique in itself is frought with recurrences. The advantages are that the tissue sampled can be sent for histology the disadvantage include that it is impossible to predict the depth of the excision in terms of nevomelanocytes location. As has been previously reviewed, the use of lasers in most dermatological indications, including acne and scars,  may not always mirror the dramatic results of the laser industry, and this is possibly true for "moles" as well. 1. Wang ECE, Sen P, Goh C, Chua S. Single treatment with 100-microsecond alexandrite laser clears selected acquired melanocytic nevi in type IV asian facial skin. J Cutan Aesthet Surg 2013;6:21-6. 2. Suzuki H, Anderson RR. Treatment of melanocytic nevi. Dermatol Ther 2005;18:217-26. 3. Sardana K, Chugh S, Garg V. Are Q-switched lasers for nevus of ota really effective in pigmented skin? Indian J Dermatol Venereol Leprol 2012;78:187-9. 4. August PJ, Ferguson JE, Madan V. A study of the efficacy of carbon dioxide and pigment-specific lasers in the treatment of medium-sized congenital melanocytic naevi. Br J Dermatol 2011;164:1037-42. 5. Duke D, Byers HR, Sober AJ, Anderson RR, Grevelink JM. Treatment of benign and atypical nevi with the normal-mode ruby laser and the Q-switched ruby laser: Clinical improvement but failure to completely eliminate nevomelanocytes. Arch Dermatol 1999;135:290-6. 6. Drummer R, Kempf W, Burg TG. Pseudo-melanoma after laser therapy. Dermatology 1998;197:71-3. 7. Urso C, Rongioletti F, Innocenzi D, Batolo D, Chimenti S, Fanti PL, et al. Histological features used in the diagnosis of melanoma are frequently found in benign melanocytic naevi. J Clin Pathol 2005;58:409-12. 8. Scope A, Tabanelli M, Busam KJ, Rabinovitz H, Braun RP, Marghoob AA. Dispelling the myth of the "benign hair sign" for melanoma. J Am Acad Dermatol 2007;56:413-6. 9. Chan HH. Laser treatment of nevomelanocytic nevi: Can results from an Asian study be applicable to the white population? Arch Dermatol 2002;138:535. 10. Cummins DL, Mimouni D, Anhalt GJ, Nousari CH. Oral cyclophosphamide for treatment of pemphigus vulgaris and foliaceus. J Am Acad Dermatol 2003;49:276-80. 11. Anderson J, Kels BD, Grant-Kels JM. Ethical considerations in alleged dermatologic malpractice. Clin Dermatol 2012;30:174-80. 12. Eads TJ, Hood AF, Chuang TY, Faust HB, Farmer ER. The diagnostic yield of histologic examination of seborrheic keratoses. Arch Dermatol 1997;133:1417-20. 13. Sardana K, Garg VK, Arora P, Khurana N. Histological validity and clinical evidence for use of fractional lasers for acne scars. J Cutan Aesthet Surg 2012;5:75-90.